Some of the controls shown are only fitted on certain models or are optional extras. It is possible to adjust the position and shape of the seat manually so that you can travel in a safe and comfortable sitting position. – Lift the lever 1 ⇒ fig. 75 and move the seat to the desired position. – Then release the lever 1 and move the seat further until the catch engages. – Lift the control 2 below the seat cushion. The front seat cushion will spring forward. – Slide the seat cushion back to the normal position after each use. – Pull the lever 3 ⇒ fig. 75 up or down repeatedly (i.e. pump the lever). – Press the front or rear part of the adjuster switch 4 to increase or decrease the curvature of the lumbar support as required. 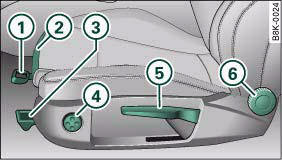 – Press the top or bottom part of the adjuster switch 4 to move the lumbar support upwards or downwards as required. – Pull the lever 5, fig. 75 up or down repeatedly (i.e. pump the lever). – Lean forwards to take your weight off the backrest. – Turn the adjuster wheel 6, fig. 75 to set the angle of the backrest as required. • Be careful when adjusting the seat height. Careless or uncontrolled use of the seat adjustment can cause injuries.